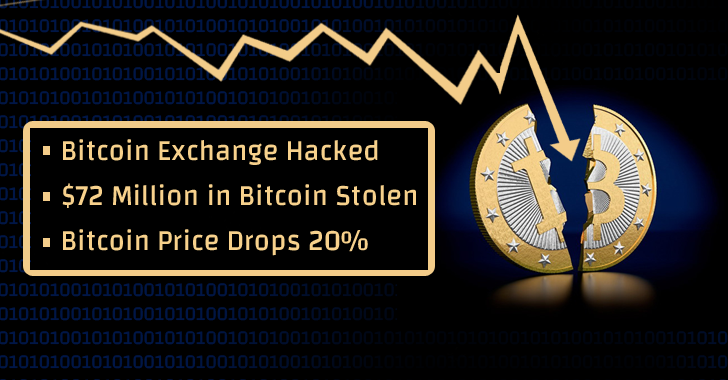 Yet another blow to Bitcoin: One of the world’s most popular exchanges of the cryptocurrency has suffered a major hack, leading to a loss of around $72 Million worth of Bitcoins. Hong Kong-based Bitcoin exchange ‘Bitfinex’ has posted a note on their website announcing the shutdown of its operation after discovering a security breach that allowed an attacker to steal some user funds. While the company did not mention a total amount lost in the breach, one of their employees — Bitfinex community director Zane Tackett — confirmed on Reddit that the total amount stolen was 119,756 bitcoins — worth up to $72 Million in cash. The cause of the security breach and the hacker behind the incident is still unclear, but the attackers appear to have mysteriously bypassed Bitfinex’s mandated limits on withdrawals. "The theft is being reported to — and we are co-operating with — law enforcement," Bitfinex statement reads. "We will look at various options to address customer losses later in the investigation" and "ask for the community’s patience as we unravel the causes and consequences of this breach." The sudden dropout could be the result of the latest hack that likely made Bitcoin investors sell off their Bitcoin holdings, leading to a rapid decrease in Bitcoin price. Bitfinex’s security firm Bitgo — a Palo Alto-based Bitcoin security company that allows bitcoin exchanges to provide separate, multi-signature wallets for each user’s funds — tweeted earlier today, saying it has not found any "evidence of a breach on any BitGo servers" during its investigation. Although it’s unclear whether Bitfinex can sustain a loss of that magnitude, the company will address any customer losses following the result of their ongoing investigation. "As we account for individualized customer losses, we may need to settle open margin positions, associated financing, and/or collateral affected by the breach," the company says. "Any settlements will be at the current market prices as of 18:00 UTC." The best way to secure yourself is to go OFFLINE. The safest place to store your Bitcoins or any other cryptocurrency is on your own (if possible, offline) wallet; instead on any website or cryptocurrency exchange.